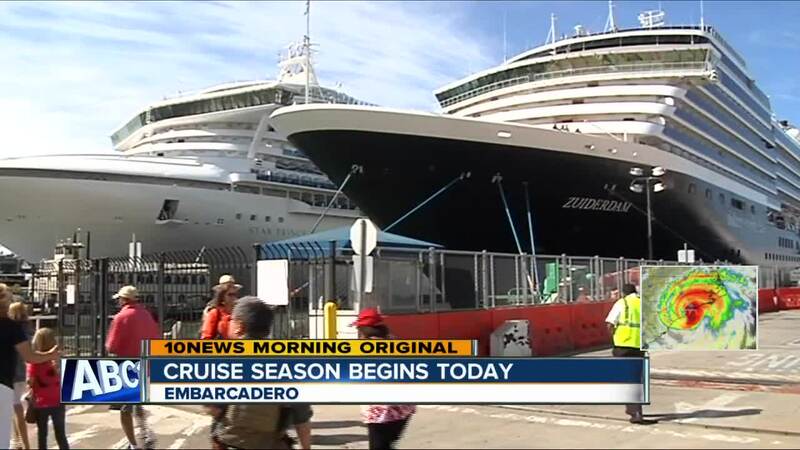 EMBARCADERO (KGTV): San Diego's cruise industry is booming as the 2018-19 season begins in San Diego. This year, the Port of San Diego expects 92 ships to dock in the bay, bringing more than 295,000 passengers. Both of those numbers are the most since 2010-11. "It's very exciting," says Port of San Diego Board Chairman Rafael Castellanos. "The cruise companies are bullish, and they're building new and bigger ships." The 92 expected port calls will bring in an estimated $130 million this season. Castellanos says the improved economy is one reason why ships are returning to town. The other reason is continued improvement of the Port district and the North Embarcadero. In 2014, the Port spent $30 million on renovations, improving the walkway, bathrooms and passenger areas. Meanwhile, development around the district has also expanded. New hotels, like the recently opened Intercontinental and Hilton towers, will soon be joined by new restaurants at the Brigantine. There are also plans to redevelop the Seaport Village shopping area. And a significant development near the old Navy complex will add shops, housing and more. "The cruise companies love that," says Castellanos. "They love San Diego because it's not like LA or Long Beach where it's very industrial. Passengers can shop, eat and explore the area." New boats stopping at the port this season include Viking Ocean Cruises' Viking Star and Norwegian Ocean Cruises' Norwegian Pearl. Also, the Disney Wonder will call San Diego it's home port this season, starting and stopping several cruises in town. Data (see chart above) from the Port of San Diego shows three years of growth since bottoming out in San Diego in 2015. That year, only 69 ships stopped in town. The peak came in 2007 when 279 ships made port calls. Castellanos says they expect the boom to continue. "Next year we have 105 calls on the schedule," he says. "We think in 3 or 4 years we'll see 500,000 passengers."